Charlie Chan is accompanied by his son Jimmy on the China Clipper from Hawaii to San Francisco. Jimmy, who is frightened by the bad storm that the plane is passing through, promises his Pop that, upon their arrival, he will immediately take a train and return to his college studies. "Do not let fair skies tomorrow change restless mind," says a pleased Charlie Chan. Also on the plane is Chan's friend, writer Paul Essex, who has just completed a mystery novel about a fake mystic. Essex is pestered by Thomas Gregory, an insurance actuary, who slyly reads a disturbing radiogram that Paul receives. 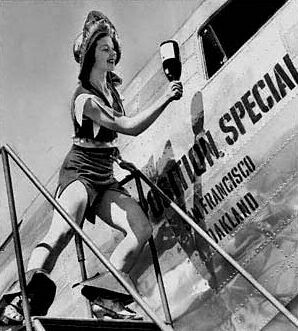 As the plane prepares to land in San Francisco, it is discovered that Paul Essex is dead of an apparent suicide. 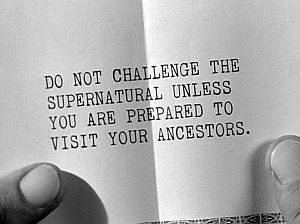 Chan reads the radiogram, which warns of the dire consequences if Zodiac obligations are ignored. At the airport, Chan breaks the tragic news to Paul's wife Stella. While still aboard the plane, Jimmy had noticed that Paul's briefcase, containing the manuscript, was missing. Both Chans suspect that it is now in the hands of Gregory, whom Jimmy follows, while Chan, hailing a taxi, is suddenly forced into one, and finds that he is being kidnapped. The master detective soon sees through the ruse of his two "abductors" who are actually plainclothes police officers. Arriving at police headquarters, Chan is greeted by Deputy Chief J. J. Kilvaine, an old friend, and is introduced to reporter Pete Lewis, another acquaintance of Chan's, and magician Fred Rhadini whom Chan had met years before when, during a performance, he had borrowed the detective's watch for a magic trick returning it "in pieces." 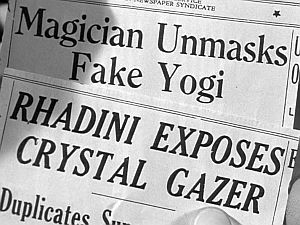 Rhadini, who operates Rhadini's Temple of Magic at the World's Fair on San Francisco's Treasure Island, and Lewis explain that they are on a crusade to expose fake psychics. Their primary target is an individual who is known as Dr. Zodiac, whom they suspect is behind the suicides of three individuals who were his clients. 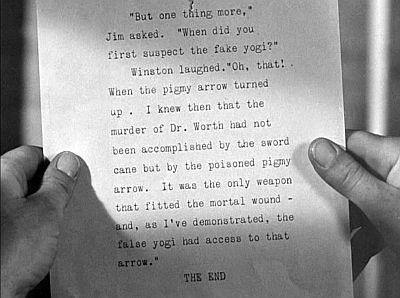 Chan, who suspects that Paul Essex is Dr. Zodiac's fourth victim, states, "In humble opinion, suicide induced by blackmail is murder." Chan goes to Zodiac's mansion and is followed there by Pete and Rhadini, who is thinly disguised as a Berkeley professor. At the door, the three ask to consult with the heavily masked spiritualist. 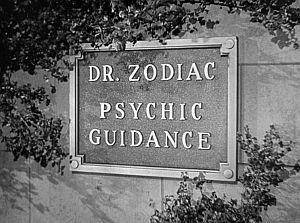 While Rhadini and the reporter proclaim that Zodiac is a fake, Chan cautions them to be careful because of the psychic's obvious mental delusions. Later that evening, Chan attends a party that Rhadini hosts in honor of San Francisco's Golden Gate International Exposition, where he is fascinated by the mind reading abilities of Eve Cairo, who is Rhadini's assistant and Pete's girlfriend. 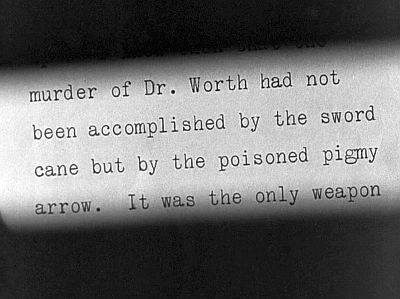 Later during the party, a knife is thrown at the detective by an unseen assailant, but narrowly misses its target. After the party, Chan, returning to Zodiac's mansion, is once again followed there by Pete and Rhadini. Upon entering the supposedly deserted edifice, the trio discovers that Jimmy is also there. The information that Dr. Zodiac has been using to blackmail his clients is found, and Chan makes sure that all of the files are burned. "Am asking flames to keep secrets of many unfortunate people," says a somber Chan. The next day, Chan decides to use Dr. Zodiac's vanity to trap him. 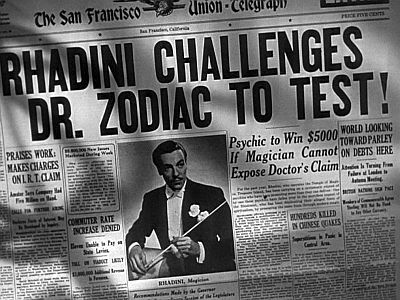 Rhadini issues a public challenge to Zodiac to put his psychic powers to the test at Rhadini's theater. Zodiac accepts the challenge and arrives at the theater in a suitably dramatic fashion. 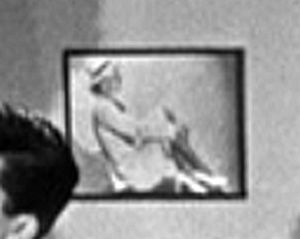 However, while Rhadini is levitating Eve Cairo above the audience, Dr. Zodiac is murdered. When his mask is removed, the victim is revealed to be the medium's servant, Abdul, "the Turk." Kilvane then informs Chan that Gregory, who is in the audience, is actually Stewart Salzbury, an insurance detective currently investigating the suicides. Working together, they help recreate the levitation trick to determine who killed Abdul. This time, instead of Eve Cairo, Jimmy is positioned on the levitating table. When Rhadini performs the trick again, the magician is stabbed in the shoulder by a knife. Chan then employs Cairo's mind reading ability to help identify the assailant and murderer. While Chan questions Eve, she states the Dr. Zodiac is not dead and that he is in the theater. Suddenly, a hand appears with a gun. The gunman is overcome, and is seen to be Rhadini, the real Zodiac, who had had Abdul pose as the medium in order to fool the police into thinking that he was dead. Chan demonstrates how Rhadini had used his magic wand as a blowgun to kill Abdul. He then wounded himself to avoid suspicion. After Rhadini is arrested and taken away, Jimmy, who stands next to his pop, falls through a trap door on stage. Chan faces the audience, smiling with apparent satisfaction as the curtain descends and the case is closed. 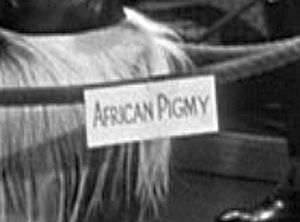 NOTES: According to Hollywood Reporter news items and production charts, John Carradine and Joyce Compton were to be included in the cast of this film, but their participation in the completed picture is doubtful. 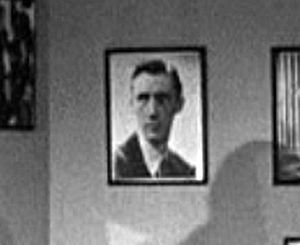 It is of interest, however, to note that two photographs, one that is certainly of John Carradine and another that is very possibly of Joyce Compton, can be seen on a wall in Rhadini's office in Charlie Chan at Treasure Island. According to Kay Linaker, Gerald Mohr was the voice of Dr. Zodiac. An April 19, 1939 Hollywood Reporter news item refers to the film as "Charlie Chan at the World's Fair." 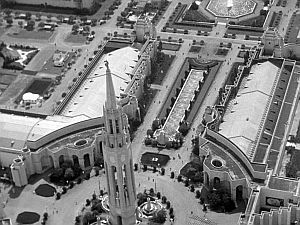 The Golden Gate International Exposition, held on Treasure Island in San Francisco Bay February 1939 to October 1940, provided the backdrop for some of the picture's action. One scholar in family better than two detectives. Only diligent workman can survive Hawaiian hospitality. Unhappy news sometimes correct self next day. Impossible to miss someone who will always be in heart. Sometimes black magic very close to blackmail. Even draperies may have ears. If request music, must be willing to pay for fiddler. To destroy false prophet, must unmask him before eyes of believers. Father who depends on son is happy or foolish according to son. Do not need brass band to commit simple burglary. Favorite pastime of man is fooling himself. If befriend donkey, expect to be kicked. Crime never solved by books. Swelled head sometimes give police more cooperation than criminal mistake. Obvious clues, like tricks in magic, usually prove deceptive. As Pop would put it: "Swelled head gives owner more trouble than indigestion." 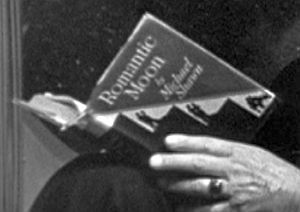 In this one, Charlie Chan bumps into a murder mystery involved with the psychic and astrological and proceeds to unravel the affair at a performance in a Treasure Island (San Francisco Fair) theatre. With Chan's gumshoeing abilities now well known to film audiences after about 25 episodes, solution is secondary to the story unwinding through a maze of weird and spooky episodes. Picture is rather slow in spots, but holds up generally to pace set by previous Chan adventures to satisfy the whodunit fans in the subsequent runs as supporting feature. Only reason for the Treasure Island tab in title is to tie into topical situation. Aside from a few stock shots of the western fair, theatre supposedly on the grounds could be anywhere. When fiction writer friend of Chan is suicide on Clipper plane bound for Frisco, Chan interests himself in finding the reasons. Trail leads him to Zodiac, racketeering mystic, who holds clients in his power through threats of blackmail. Chan is assisted by Cesar Romero, operating illusionist theatre at the Fair, and Douglas Fowley, reporter exposing rackets of the mystics and astrologists. 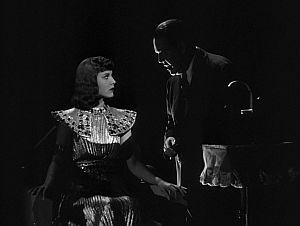 After usual confusing trails presented to the audience, with Douglas Dumbrille pointed as most likely suspect, Chan discloses the identity of Zodiac during performance on the theatre stage. Romero, Dumbrille, Donald McBride and Fowley are most prominent in support. Chan's No. 2 son, Sen Yung, does much to confuse things with amateurish display of detecting abilities. Production background is up to standard set by previous releases in the series. "Table lamp of ancient Egypt - Rameses Dynasty"
"Persian sacrificial knife - also very old"
DR. ZODIAC'S INTRODUCTORY TITLE: "Dr. Zodiac, the Eye of Allamatta." ACCORDING TO DR. ZODIAC, THE IDENTITY OF HIS "CONTROL" DURING THE SEANCE: "An Egyptian priestess who passed beyond 3,000 years ago." THE LOCATION OF THE PARTY THROWN BY FRED RHADINI AT TREASURE ISLAND: "Hawaiian Village"
ACCORDING TO THOMAS GREGORY, THE ODDS AGAINST FELLOW TRAVELERS MEETING AGAIN WITHIN 48 HOURS: "...40 to 1..."
ACCORDING TO FRED RHADINI, THE NUMBER OF PERFORMANCES GIVEN BY RHADINI EACH DAY AT THE "TEMPLE OF MAGIC" ON TREASURE ISLAND: "...I'll give two performances a day at the Temple of Magic." Rhadini: "What have I in my hand?" Cairo: "It is a ring, a gold wedding ring. In it are engraved words: 'Bopsie loves Toots.'" Rhadini: "I've been asked a question; what is it?" Cairo: "The lady wishes to know if she will marry again this year." Cairo: A card. There are Chinese characters on it... (after reading Charlie Chan's mind as to the meaning ot the characters) The Chinese words mean: 'Great happiness follows great pain.'" Rhadini: "Can you tell us what else Mr. Chan is thinking?" Cairo: "Dr. Zodiac. I hear the name Dr. Zodiac in his thoughts." Rhadini: "Would you please concentrate Miss Cairo. What do I hold in my hand?" Cairo: "It is...you...There's someone else. I can't go on...I can't. I hear death among us. I'm frightened. There's evil here. Someone here is thinking murder!" THE FAMOUS VENTIRILOQUIST'S DUMMY AS MENTIONED BY CHARLIE CHAN: "Doctor (Zodiac) excellent ventriloquist - uncle maybe to Charlie McCarthy." ACCORDING TO CHARLIE CHAN, THE GIST OF THE STORY WRITTEN BY PAUL ESSEX: "...story about fake psychic who blackmail clients." 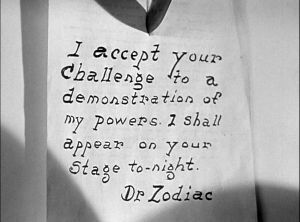 ACCORDING TO CHARLIE CHAN, THE DISORDER THAT BEST EXPLAINED DR. ZODIAC'S BEHAVIOR: "...pseudologia fantastica." THE DESCRIPTION OF "PSEUDOLOGIA FANTASTICA" AS READ FROM KAHNE'S BOOK BY CHARLIE CHAN: "Pathological liars and swindlers suffer from exaggerated fantacy, unleashed vanity, and great ambition which robs them of caution known to saner men." items and production charts, was to have appeared in this film. 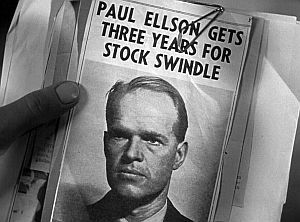 news items and production charts, was to have appeared in this film. 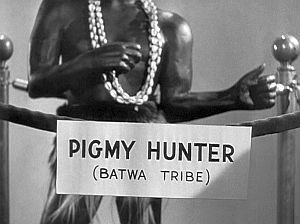 Sign: "PIGMY HUNTER (BATWA TRIBE)"
Pete Lewis: "Rhadini's improved now, Charlie, he's a big shot." Deputy Chief J.J. Kilvaine: "Well, Charlie, if this don't send me back to Billy Goat Hill pounding pavement..."
Pete Lewis: "...you might have her buffaloed, but you don't fool me!" Charlie Chan: "Doctor excellent ventrilloquist - uncle maybe to Charlie McCarthy." Chinese Pagoda - Called the Golden Pagoda of Chinatown, this structure was the prominant feature of the Chinese Village section of the Golden Gate International Exposition, held at Treasure Island in San Francisco from 1939 to 1940. A pagoda is a religious building of the Far East, especially a multistory Buddhist tower, erected as a memorial or shrine. Jimmy Chan: "That's the Chinese Pagoda." 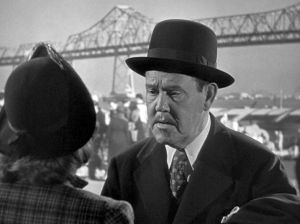 Deputy Chief J.J. Kilvane: "You and I are going to have an old fashioned chin fest, Charlie." Although the Clippers were each named for their destinations, that is, Hawaii, Philippine, and China, they were commonly referred to as "China Clippers." The China Clipper cruised at about 160 miles per hour and had a range of 3,200 miles. Later models that were added to the Clipper fleet could cruise at just over 180 miles per hour at a range of about 3,500 miles. A flight between San Francisco and Honolulu cost passengers a hefty $720 and would take between 18 and 20 hours, flying at an altitude of about 8,000 feet. Paul Essex: "This trip blew the cobwebs out of my head." Pete Lewis: All kinds of dope about all kinds of people." Charlie Chan: "Ectoplasm most interesting - ghost filled with hot air." Pete Lewis: "Why, you cheap four-flusher..."
Jimmy Chan: "Gregory gave me the slip at Customs." 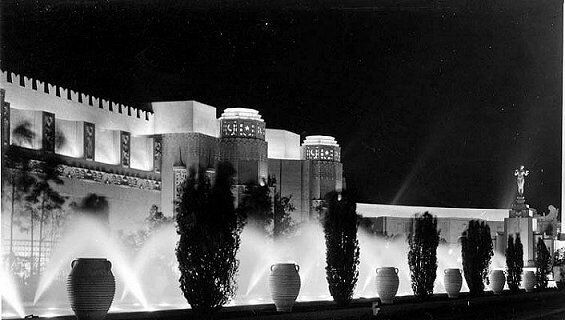 Golden Gate International Exposition - Held on Treasure Island in San Francisco Bay from from February 18 through October 29, 1939 and from May 25 to October 29, 1940, the Golden Gate International Exposition, which provides the backdrop for much of Charlie Chan at Treasure Island, demonstrated an eclectic blending of European, Eastern and Latin American architectural, landscape, and artistic styles. Evoking the exoticism of Pacific Rim cultures such as the Mayas, Incas, Malaysians, and Cambodians, many of the architectural structures reflected a nostalgic look at past civilizations. However, there were examples of a stream-lined, international style architecture, seemingly out of place with these other styles, but meant to reflect western nations along the Pacific Rim. 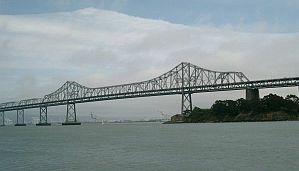 Reinforcing this theme of modernism and technological innovation was the celebration of the earlier completion of the Golden Gate and San Francisco/Oakland Bay Bridges. 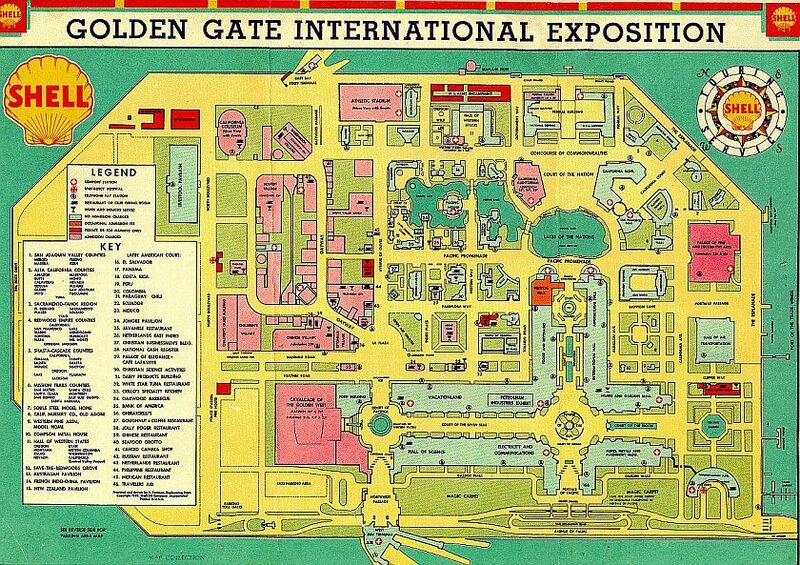 The Golden Gate International Exposition was the location of much of the action seen in Charlie Chan at Treasure Island. Bessie Sibley: "Why, that jealous gutter snipe!" Pete lewis: "...I'll give you a blast in print that'll run you out of this town with your gyp fortune telling!" 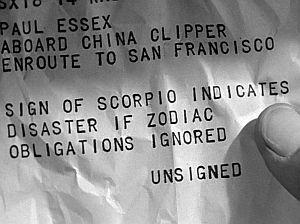 Pete Lewis: "Zodiac took it hook, line, and sinker." Taxicab Driver: "I know this spook joint." Fred Rhadini: "...since the first magician laid an egg." Thomas Gregory: "Mr. Chan, I've come to lay my cards on the table." Pete Lewis: "Boy, what a layout." Deputy Chief J.J. Kilvaine: "Now listen you two mugs..."
Pete Lewis: "Now we can nail him." Jimmy Chan: "...but we nicked this case." Jimmy Chan: "Let's call up the Granville Insurance Company and find out if Gregory's on the level." Jimmy Chan: "Gee, Pop, I certainly had him pegged wrong." Jimmy Chan: "Boy, am I going to pin it on him." Charlie Chan: "Would favorite son like to make personal pinch?" Pete Lewis: "...ever since I started covering the police blotter at the old Powell Street station." Deputy Chief J.J. Kilvaine: "Well, Charlie, if this don't send me back to Billy Goat Hill pounding pavement, I'm an Eskimo!" Pete Lewis: "...to write a story about the spook racket?" Deputy Chief J.J. Kilvane: "Was he squeezing Paul Essex?" 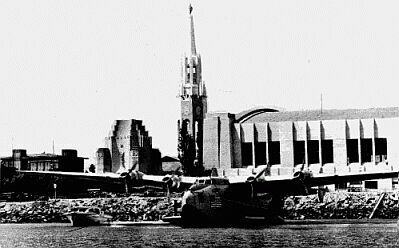 Pan American World Airways Clipper in the seaplane harbor at Treasure Island in San Francisco Bay. On November 11, 1935, Pan American Airway's China Clipper, a Martin M-130 flying boat, piloted by Captain Edwin C. Musick, made the first transpacific airmail flight from San Francisco to Honolulu, Midway Island, Wake Island, Guam, and Manila in the Philippines. 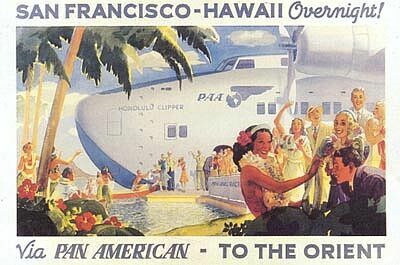 Regular Clipper service between Honolulu and the mainland continued throughout the 1930s and into the start of the next decade until the Japanese attack on Pearl Harbor. 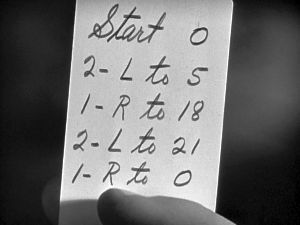 Charlie Chan made fairly regular use of the Clipper route between Honolulu and San Francisco, flying on the plane to the mainland in Charlie Chan's Secret (1936), Charlie Chan at the Olympics (1937), Charlie Chan in Reno (1939), and Charlie Chan at Treasure Island (1939). During the last decade the world's two largest bridges have been flung across San Francisco Bay...and to celebrate their completion, the world's largest man-made island now has risen from the waves. Pacific Northwest, April 1939. Photo by Haas-Schreiner. Beneath the level waters of the Bay is an uneven terrain down to 2 to 382 feet. Mariners long have avoided the treacherous shoals just north of Yerba Buena Island, in no place deeper than 26 feet. 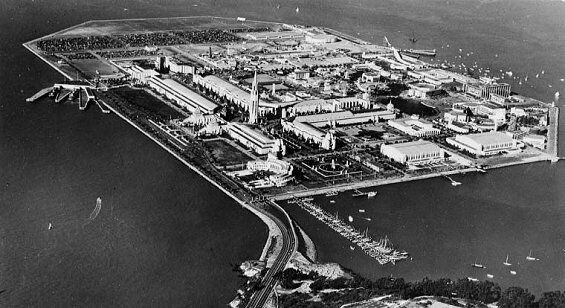 These watery acres were waste territory -- until it was decided to create upon them the site of the Golden Gate International Exposition, to be known as Treasure Island during 1939 and thereafter to become an airport for the trans-Pacific clipper ships. Rock walls composed of 287,000 tons of quarried rock were sunk in the shoals. Twenty million cubic yards of sea bottom were dredged up and piled within the walls. When the sand was 13 feet above sea level, engineers "unsalted" it by a leaching process. Barges brought 50,000 cubic yards of loam from the mainland to enrich it. When the engineers finished, a 400-acre island, a mile long and two-thirds of a mile wide, had appeared in the Bay, connected by a 900-foot paved causeway to the Bay Bridge and equipped with ferry slips and landings for small craft and flying boats. Meanwhile botanists were hunting through all the continents for unusual trees and plants. For many months orchids, hibiscus, datura, rare silver trees, orange trees, and palms were acclimated in a San Francisco plant hospital, where also are the electrically heated propagation beds that bring to bloom the plants to compose the ever-changing floral patterns of the Fair grounds. Horticultural plans call for planting 4,000 trees, 70,000 shrubs, and 700,000 flowering plants. To sprinkle the plants--and quench the thirst of visitors--San Francisco water was piped over the San Francisco-Oakland Bay Bridge to a 3,000,000-gallon reservoir cut in the solid rock of Yerba Buena Island. With federal aid were commenced three permanent structures that later will serve the airport--the $800,000 administration building and the two $400,000 steel and concrete hangars, each 335 feet long and 78 feet high, used temporarily to house the $20,000,000 art exhibits and the foreign treasures loaned for the Fair. 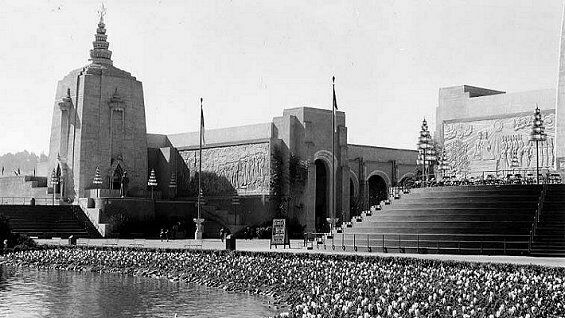 Finally, around these structures, began to rise a $50,000,000 fantasy -- America's World's Fair on the Pacific. The fair grounds are designed as a walled city, enclosing a series of connected courts. Although a primary consideration was to plan step-saving routes across the 400 acres, the effect first noticed is the island's beauty--its vistas of pools, gardens, and lagoons, bordered with exotic buildings representing the Pacific nations. Cambodian, Mayan, and Incan motifs give a charming strangeness to this modern Exposition "city." From the Central Court, where the Island's two systems of avenues and courts intersect, rises the 400-foot Tower of the Sun. Northward the mile-long Avenue of the Seven Seas leads to the Court of Pacifica, portal to the Fair's open-air pageant, the Cavalcade of the Golden West; southward, to the Port of the Trade Winds, anchorage for trade ships, junks, square riggers and yachts. The main cross-avenue leads to the central Court of Honor into the Court of the East and thence to the lake of All Nations, a lagoon overlooked by the $1,500,000 United States Government Building and exhibit area. At the north end of the island, next to the 12,000-car parking lot, lies the Gayway, a 40-acre fun zone, with its cyclone coaster, rocket ship, giant crane, and other thrill rides and shows. In the exhibit pavilions, visitors will see a $1,000,000 "mineral mountain" of ore with miniature models showing gold mining operations and a $1,000,000 relief map of Western America--so large that the borders of the States can be traversed on foot paths. They will witness demonstrations of the electric eye, television, electronic music, atom-smashing, chemical agriculture. The latest sub-stratosphere transport planes--even Douglas Corrigan's famed "Corrigan Crate"--will be on exhibition. 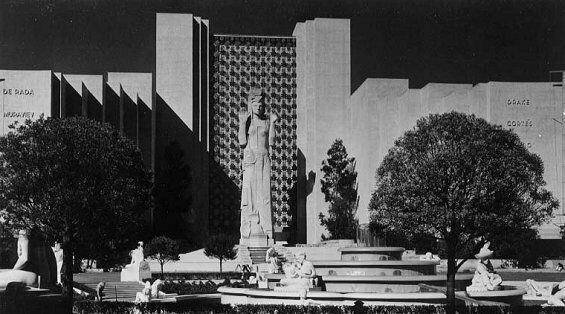 Forty or more foreign nations will exhibit in the International Building and Pacific Nations' Exhibit Area; the United States and nearly half the States of the Union, in the Federal Building and Hall of Western States; the State and Counties of California, in the California Building Group. A cross-section of American business and industry will be displayed in pavilions and exhibits valued at more than $15,000,000--the Halls of Varied Industries, Electricity and Communications, Foods and Beverages, Homes and Gardens, Mines, Metals, and Machinery, Science, and Vacationland. The Fair's Gayway, a mile-long circular boulevard, will be lined with showplaces--the Chinese City, Hollywood Boulevard, Streets of the World, and many others. The island's colors, stimulating, unforgettable, represent the first extensive application of chromotherapy--the science of health treatment by color usage. In the daytime the effects are gained with flowers and tinted walls; at night, with fluorescent tubes, with the new "black light," with ultra-violet floods, underwater lamps, translucent glass fabric pillars, and cylindrical lanterns 75 feet high. Some of the flower beds are played upon by artificial moonlight, others bathed in sunshine created out of neon and mercury. The $1,000,000 illumination program presents at nightfall the illusion of a magic city of light, floating on the waters of San Francisco Bay. From: Almanac for Thirty-Niners, compiled by the Workers of the Federal Writers' Project of the Works Progress Administration in the City of San Francisco, 1938.
held on Treasure Island near San Francisco in 1939. Ralph Stackpole, is visible at the end of the court. The Temples of the East. A nighttime view of the Court of the Moon. Please click here for larger version map.